Tens of thousands Brazilian demonstrators took to the streets on Sunday to protest the social and economic policies of President Dilma Rousseff. The marchers claim the country’s leader supports corruption and demand that she resigns or is impeached. The event, which was promoted through social media, saw around 190,000 people take part, according to organizers. They had hoped more than a million would show up. Police estimates put the total number of protesters at about 100,000, the television station Globo reported. 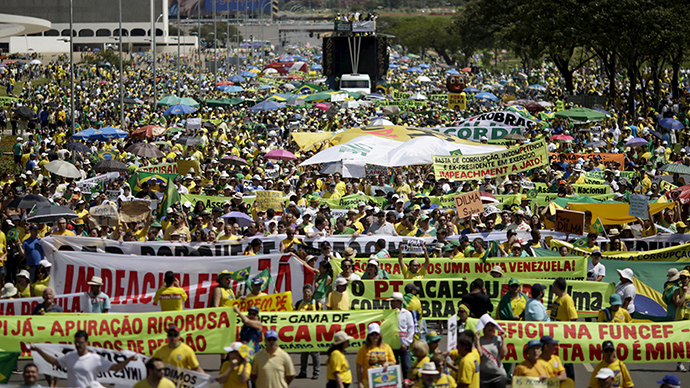 Demonstrations were recorded in 14 of Brazil’s 26 states, including in the country’s capital Brasilia. Around 400 cities across the South American nation were expected to participate. Rousseff’s opponents have been expressing their anger at a large corruption scandal involving the state oil firm Petrobras, with many protesters claiming that the president was aware of kickback schemes. Authorities allege that some of the nation’s largest construction companies bribed politicians and government officials to secure $23 billion in contracts with Petrobras. Earlier in March, Brazil’s Supreme Court approved the investigation of 54 people for their alleged involvement in the scandal. Although President Rousseff is not among the suspects, most of the protesters demand that she should be impeached. The protest in Brasilia saw 25,000 people participating, however, marches in Rio and Sao Paulo had lower turnouts than was expected. Activists are hoping their demonstrations would help to implement impeachment proceedings. “[Rousseff] must be impeached because she and the Workers’ Party are responsible for all that is wrong with Brazil – corruption, inflation and unemployment on the rise, terrible public services like health and education,” Sao Paulo protester Renato Alves Pereira told AP. Others are sceptical that the movement would achieve its goal, saying that with the size of the protests decreasing, they could begin to fizzle out. The president’s ratings have been plummeting to new lows after she began her second term in January. Just 13 percent of Brazilians are pleased with the way the country’s leader is running the country. Meanwhile, a recent survey by the Folha de S.Paulo newspaper showed that over 60 percent of those polled, say they would support Rousseff’s impeachment. Sunday’s protests were the second large-scale demonstrations in Brazil in less than a month. On March 15, more than 1.7 million people from across the country gathered to show their disapproval of the Brazilian president.